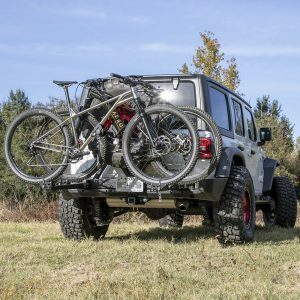 The ROAM JL Tire Carrier Rear Bumper (Jeep Wrangler JL Rear Bumper with Tire Carrier): Max departure angles, mixed 1/4″ and 5/16″ high strength steel construction, integrated full size tire carrier (up to 42″/44″ tires), and an integrated trailer hitch. Laser cut and fully seam welded for ultimate strength and protection, the ROAM JL Tire Carrier Rear Bumper is 2 stage textured poly powdercoated for surface durability. No drilling, cutting, or welding is required for installation. Exceeds all OE specifications for resistance to the elements. Made with pride in the U. S. of A. – Includes a ROAM JL Backup Camera Relocation Kit (ROAM JL Rear View Camera Relocation Kit). 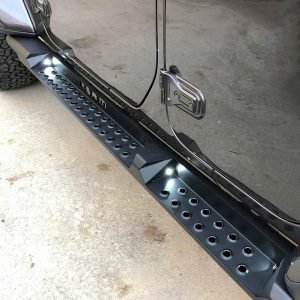 On our JL Tire Carrier Rear Bumper, an adjustable rear camera relocation kit is included with purchase along with an extension wiring harness. – On our JL Tire Carrier Rear Bumper, what sets our design, build process, and quality apart isn’t just how strong our stuff is, but rather how each and every part is designed and built. The ROAM JL Tire Carrier Rear Bumper is precision laser cut and fully profiled on the interior edge to evenly and consistently follow the curvature of the vehicle.